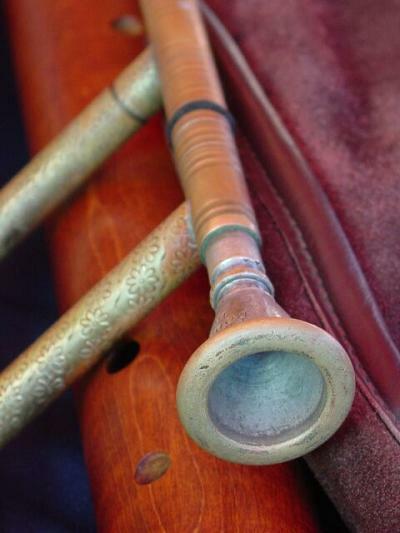 "However, for the lowest contratenor parts, and often for any contratenor part, to the shawm players one adds brass players who play very harmoniously, upon the kind of tuba which is called ..trompone in Italy and sacqueboute in France. When all these instruments are employed together, it is called the loud music." 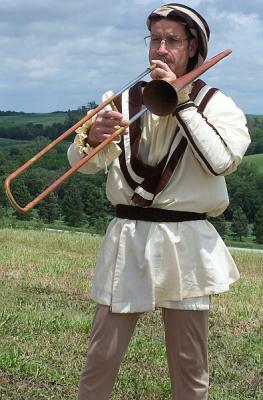 Many names have been given to the Renaissance trombone, including sackbut (literally "push-pull"), saqueboute, shakbusshes, seykebuds, sakbuds, shakebuttes, shagbutts, and even shagbolts. It is uncertain when the sackbut first appeared, but by 1500 it is illustrated and mentioned regularly. Detailed information about the instrument is given by Praetorius, who also pictures four principal sizes: the alto, tenor, bass, and great bass. The tenor sackbut is the most useful size and it is this instrument which has evolved into the modern tenor trombone. In the early seventeenth century the sackbut was considered an instrument of the virtuoso performer. Praetorius mentions an Erhardus Borussus of Dresden who had a range of nearly four octaves (low A1 to g2) and was able to execute rapid coloraturas and jumps on his instrument just as is done on the viola bastarda and the cornett. 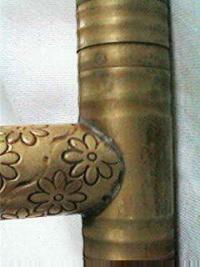 For outdoor music the top part of a sackbut ensemble was usually taken by a shawm, and for church music, by a cornett. The sackbut player should imitate the sound of the cornett, not the trumpet. Thus today's marching band trombone blasts have no place in the performance of early music. In spite of the instrument's wide range of dynamic and chromatic compass, and its ability to be played "in tune" (by slide adjustment), the sackbut did not become a regular member of the orchestra until the early nineteenth century. The sackbut differs from today's trombone by its smaller bore, its bell which is less flared, and in the lack of a water key, slide lock, and tuning slide on the bell curve. Sackbuts could adjust tuning at the joint between the bell and slide. 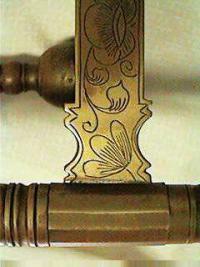 The shallow brass mouthpiece was unplated. Decorated outer slide braces could telescope slightly to follow the imperfections of the inner slide. Leather pieces cushioned the slide when brought up to first postion. Since the human arm couldn't reach the longest positions on the bass and great bass sackbuts, they have an articulated handle on the slide to extend the reach. Musica Antiqua's collection includes an alto in F, a tenor in B-flat, a bass in E-flat by Finke and two tenors in B-flat by Meinl and Lauber. The Shrine to Music museum in Vermillion S.D. 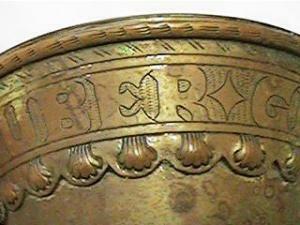 has an original which appears to be the model for the Meinl and Lauber replicas.